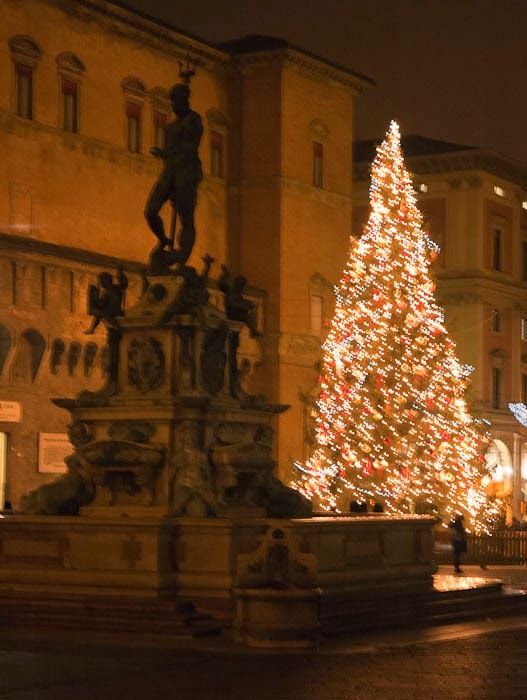 Neptune's fountain with Bologna's Christmas tree. Buon Natale and Merry Christmas! I hope everyone who celebrated yesterday had a great day with family, friends, and loved ones. 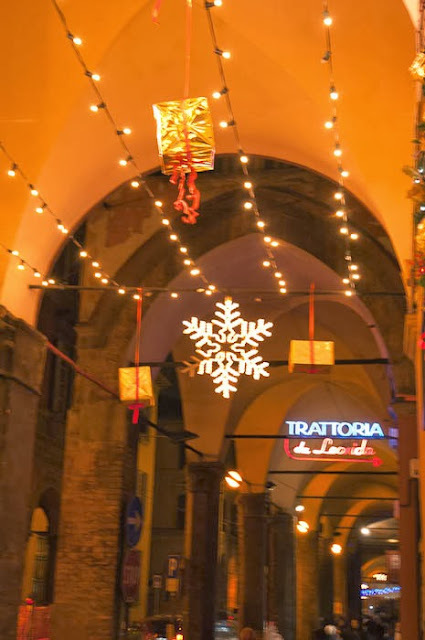 I love Christmas in Bologna. My favorite part is how the city decorates for Christmas; they string white, twinkly lights all over the city and along the front of the the Asinelli tower, the tallest tower in the center of town. I remember the very first time I saw the lights and the excitement and thrill I felt. Every year, when I see the lights for the first time it makes me smile. 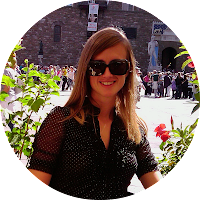 The city feels inviting, intimate, and comfortable – like the soft sweater you always go back to when it is cold and you want to feel warm and cozy. 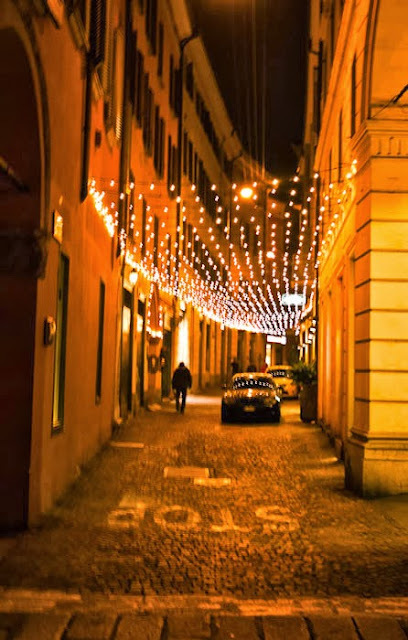 The lights cast a warm glow over the whole city and could make even the biggest Scrooge or Grinch smile and remember the true spirit of Christmas (love, kindness, and gratitude). 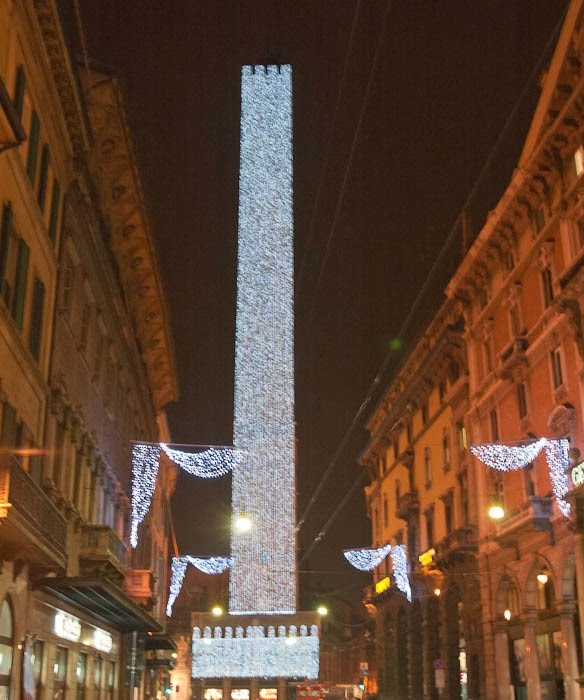 Torre Asinelli (the Asinelli tower - the tallest in Bologna) all decked out with lights for Christmas! The tower with the lights on it can be seen for miles and miles around! I love the creativity of this decoration. In addition to the lights, this shop owner strung up presents under the portico. One of my favorite little streets in Bologna, Via del Luzzo, always looks so festive completely covered with Christmas lights. 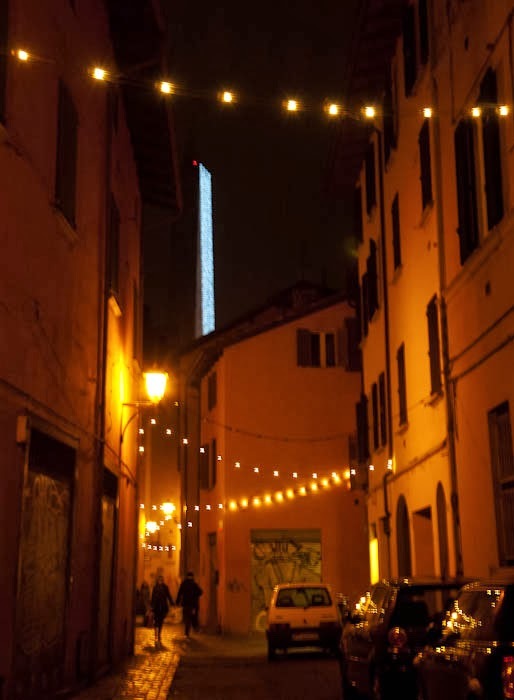 Glimpes of the tower, shining bright, can be seen from all over the city.